If You're Buying A New TV Read This First! Home theater, video, and television expert with over 29 years of experience writing about the subject for Entertainment Weekly, Popular Science, and New York Newsday. Different TV technologies make a difference, here's how. Buying a new TV used to be easy – you'd pick a screen size and a cabinet finish and boom, you were done. 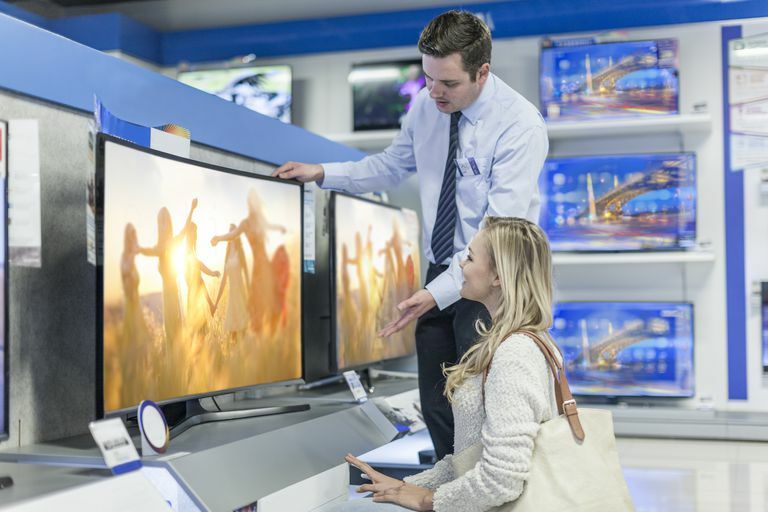 But buying a TV in today's market presents so many choices and complexities that confusion is rampant, not only for the buyers but often for the sellers too. The web is packed with TV reviews and specifications, but specs don't tell the whole story and reviewers can only relate their own experiences with a product. Those can be very different from your own needs and expectations. The best way to know "what's the best TV for me" is to prep yourself a bit before making your choice. Here are some helpful tips. This information applies to televisions from a variety of manufacturers including, but not limited to, those made by LG, Samsung, Panasonic, Sony, and Vizio. While it may seem counter-intuitive, in the world of TVs, bigger isn't always better. A screen that's too large for your normal viewing distance will be fatiguing and strain-inducing to watch. Moreover, if most of your program choices are standard definition (like DVDs, non-HD cable, and Internet streams), a bigger screen may actually look worse to you than a smaller one - any imperfections will be magnified and very apparent. On the other hand, a too-small screen won't give you the immersive video experience you're looking for. A good rule of thumb is to choose a screen size that's one-third of your normal viewing distance. If you sit 10 feet away from the screen (120 inches), a 40-42" inch model will serve you nicely, and so on. There are numerous flat-panel TV technologies on the market, including LCD, two types of LED TVs (though these are really LCD TVs with enhancements) and plasma TVs. There are also still some big rear-screen projection TVs that use DLP technology, and of course, there are front projectors that use your wall or an external screen to display pictures, but these are a different animal. All these TV technologies have their pros and cons. Some will give you a better picture than others, some perform better in bright rooms than others. Some are more economical to buy, while others command a price premium thanks to super-thin styling. Some TVs aren't flat at all but emphasize screen size, value, and performance, if you've got the space for a non-flat set. To get a better sense of the advantages that each of these technologies offers, see our TV Technology Comparison Guide. When fed with a nice high-definition signal, most TVs, even cheap ones, can look really good. And if that's all you watch, most TVs will offer a very satisfactory picture; you can prioritize other criteria to make your choices, like styling or price. But not all programming is high-def, notably DVDs, non-HD cable and satellite, and Internet video like YouTube. When these signals are fed to an HDTV, the TV converts them to its own "native" resolution - a digital process that's no small trick to perform well. A too-cheap HDTV will likely have lower quality video processing to convert and display these non-HD signals, with the result being a picture that can be surprisingly poor. Whenever you see bad picture quality on an HDTV, poor video conversion is almost always the culprit. If non-HD sources make up a lot of your viewing habits, it's worth considering the mid-to-higher level offerings from any given manufacturer's "good-better-best" selection. A few dollars more (sometimes not many at all) can often be the difference between a TV you love and one you regret. Better models (often denoted by a different model "series") are often more technologically capable than lower model series. Bright Room or Dark Room? Many plasma TVs feature a screen with a high gloss finish that will clearly reflect light – not just from windows, but even from everyday objects even in a darkened room that the TV screen itself is lighting up, such as glass coffee tables and framed wall pictures. Many LCD sets use a screen material that's more matte-finished and minimize this problem, but not all do. LED TVs often go either way. Take stock of the room where this TV will live. If you'll be doing a lot of daytime watching and there are windows in the room, the surface of your screen's TV should be a consideration. If you'll be mounting the TV on a wall, choose a wall mount that lets you tilt or angle the TV. Often a small change in angle will help a great deal with unwanted reflections. The Internet is the world's biggest marketplace, but just like any other marketplace, it includes some disreputable members. An unauthorized retailer might give you a great price and you'll think you found a bargain. But then you get the product and perhaps it's not factory fresh. Or there's a problem with it and you'll like an exchange, but the unauthorized dealer won't take it back. Or they will…for a 20% restocking fee. In some cases, these retailers are even selling "gray goods" – products which were built for non-US markets and have been illegally transshipped for sale here. Know that almost without exception, no manufacturer will honor a warranty for a product that's been purchased from an unauthorized reseller. Whether you buy online or in-store, make sure that the retailer is authorized to sell that product and brand. If they are, they'll tell you so right away. If they fudge the answer to this simple question, move to another retailer. Regardless of the price, they offer you, it's not worth it. It's really easy to buy a TV – you can do it in minutes, even from your phone. But once you've done it, the purchase will be an important part of your life for years to come. This is no time to make a decision based on expediency; just because you happen to be standing in a store doesn't mean you have to leave with a new set, and today's free shipping "special" is no reason to hastily click the Buy Now button. Take your time, check out prices, educate yourself to the extent that you want to here and elsewhere, ask your friends if they like their TV. You'll find that a bit of research and patience will pay off with a great experience that will last for a long time -- until you're ready for your next new TV!